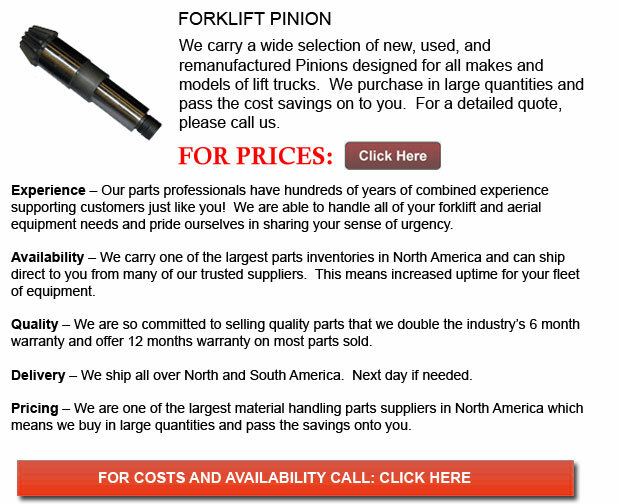 Forklift Pinion - The king pin, typically constructed out of metal, is the major pivot in the steering device of a vehicle. The initial design was actually a steel pin on which the movable steerable wheel was mounted to the suspension. Able to freely turn on a single axis, it limited the degrees of freedom of movement of the remainder of the front suspension. During the 1950s, when its bearings were substituted by ball joints, more detailed suspension designs became accessible to designers. King pin suspensions are nevertheless utilized on several heavy trucks as they have the advantage of being capable of carrying a lot heavier cargo. New designs no longer restrict this particular device to moving similar to a pin and today, the term may not be utilized for a real pin but for the axis in the vicinity of which the steered wheels pivot. The kingpin inclination or also called KPI is also referred to as the steering axis inclination or otherwise known as SAI. This is the definition of having the kingpin placed at an angle relative to the true vertical line on most modern designs, as viewed from the front or back of the forklift. This has a major effect on the steering, making it tend to return to the centre or straight ahead position. The centre position is where the wheel is at its highest position relative to the suspended body of the forklift. The motor vehicles weight has the tendency to turn the king pin to this position. Another effect of the kingpin inclination is to fix the scrub radius of the steered wheel. The scrub radius is the offset amid the projected axis of the steering down through the kingpin and the tire's contact point with the road surface. If these items coincide, the scrub radius is defined as zero. Even if a zero scrub radius is likely without an inclined king pin, it requires a deeply dished wheel in order to maintain that the king pin is at the centerline of the wheel. It is more sensible to slant the king pin and utilize a less dished wheel. This likewise offers the self-centering effect.